Just like with movies, you sometimes see a few television shows about the same idea come down the pike. Recently, we had two "supernatural child" shows (Touch and Believe), and a handful of supernatural medical shows. But here are 10 TV show ideas that keep coming back again and again. When you think about it, it's kind of bizarre that there are dozens of paranormal reality TV shows with titles like Ghost Mine, Ghost Lab, Rescue Mediums and Paranormal Paparazzi. But those paranormal reality shows are pretty successful, so you can see why they keep making them. Some of the ideas below are equally quirky, but often have a lower success rate. 1) Comedies about families living with ghosts. This is a timeless classic, with a surprisingly large number of moderately successful shows, in which a weird ghost (or ghosts) disrupt the life of some uptight living people. The fact that you're living among people who have usually died in some horrible, brutal fashion is usually downplayed. 2) Dr. Jekyll & Mr. Hyde Remakes. The BBC scored a critical success with Stephen Moffat's 2007 miniseries Jekyll, but other attempts to translate Robert Louis Stephenson's classic tale to an ongoing series haven't been quite as well-received. In 2011, ABC had two series based on Jekyll and Hyde in development, and neither one made it to air. The idea of a show where every week the main character keeps turning into a psycho and then back into himself/herself feels like it might be tough to sustain for weeks and weeks, let alone years. Other examples: Do No Harm (2013), My Own Worst Enemy (2008), Julia Jekyll and Harriet Hyde (1995-1998), plus a number of straight-up made-for-TV adaptations including the 1973 musical version. Everybody loves movies about haunted houses — but TV shows about buildings with weird supernatural entities or sinister presences have never quite managed to last on the small screen. Let's just blame Stephen King for this. Examples: Bedlam (2011), Rose Red (2002), Kingdom Hospital (2004), 666 Park Avenue (2013), Alcatraz (2012), American Horror Story: Murder House (2011). 4) The virtual and real worlds collide! The new Roland-Emmerich-produced show New Angeles will be the first virtual reality show to appear in a while, but this has been a big trope for quite some time. Often, the dangerous and uncontrollable world of virtual reality will clash with the "real" world and create complications for people. Or people get trapped in the cyber-world. 5) "Buddy cop" show where one cop isn't human. 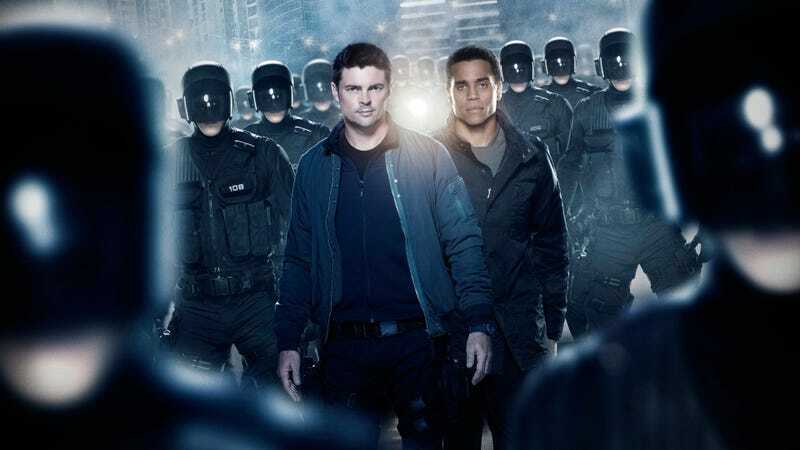 Everybody loves a cop show about an odd couple — but what makes it even better (and odder) is when a human cop is paired with a robot. Or an alien. Or a time traveler. For example, in Blood Ties (2007-2008), one detective is going blind, and the other one is the vampire son of Henry VIII. 6) Shows about immortals (who aren't vampires) walking the Earth. This month sees the launch of Forever, a new ABC show about an immortal who becomes a medical examiner (and solves crimes alongside a human woman, making him also an example of #5.) The Highlander show is an unusually successful example of this format. Other examples: The Immortal (1970), The Immortal (2000), Highlander: The Series (1992-1998), Highlander: The Raven (1998-1999), New Amsterdam (2008). For every "cute alien" sitcom (a surprisingly successful genre that includes Third Rock, Mork and Mindy, ALF and a few other shows), there are a number of shows about evil aliens who are A) scheming to take over the planet and B) hiding in plain sight, among us. As opposed to the X-Files/Torchwood model of "case of the week, plus mythos," these are shows where it's just the ongoing plot of the sinister aliens conspiring. 8) A human family has one or more non-human members. The latest example of this trope is Extant, where Halle Berry has a robot son. But there have been a number of shows where one family member is an alien, a robot, or a mutant — some of them pretty successful. (In the show Out of this World, a family has a human mom, but an alien dad and a half-alien daughter who can stop time.) These shows generally revolve around the humans trying to deal with their non-human spouses or offspring, and probably aren't that different from "family lives with ghosts" shows, most of the time. Examples: The Second Hundred Years (1967-1968), Small Wonder (1985-1989), Out of this World (1987-1991), Meego (1997), Aliens in the Family (1996), ALF (1986-1990), My Favorite Martian (1963-1966), Stepsisters from the Planet Weird (2000), Marvin Marvin (2012-2013), Kyle XY (2006-2009), Extant (2014-present). There have only been a handful of shows along these lines, but it's still a lot considering what a quirky concept it is. In The Collector (2004-2006), a man has been helping the Devil collect souls for 600 years, but now he wants to help them instead. In Brimstone (1998-1999), a dead cop comes back to life as the Devil's soul-collector. Reaper (2007-2009) is probably the most famous show about guys collecting souls for the Devil. And then there's Dead Like Me (2003-2004), where George helps souls pass over. 10. We travel through time to fight crime! Quantum Leap is probably the most successful U.S. show about a guy who jumps through time and solves problems — but he's not really a crime-fighter, per se. When it comes to time-traveling detective/crime shows, the most successful in recent years is probably Continuum on Syfy. But there have been a slew of shows where someone goes back in time (a few days or several years) and has to solve crimes in the past.